The new school year means the start of the Winnipeg Jets Hockey Academy (WJHA) season. The WJHA crew has been busy cleaning and organizing the equipment to get over 750 student athletes ready for their hockey season. 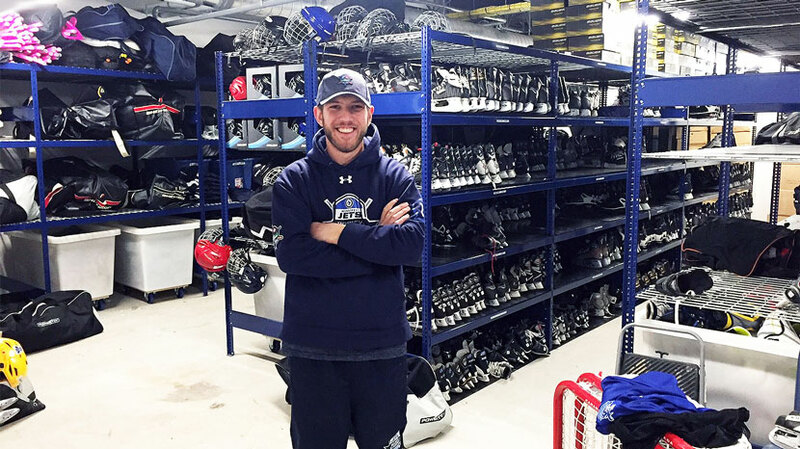 In order to improve the fitting process, lockers were installed in the True North Youth Foundation’s 800 square foot equipment storage room at Bell MTS Iceplex where an average of 60 students a day are fitted in preparation for the season. An extensive fitting schedule is created in order to coordinate the busloads of students that will be brought to the facility. Once at the Bell MTS Iceplex, students are greeted and brought to the Press Box restaurant where they are treated to lunch and a movie while they wait for their personalized fitting. The WJHA staff take 10-12 students at a time to get fitted for equipment, including cutting a stick to their height, and labelling their hockey bag. The students then bring their equipment back to the school so that they can be prepared for the first ice session. 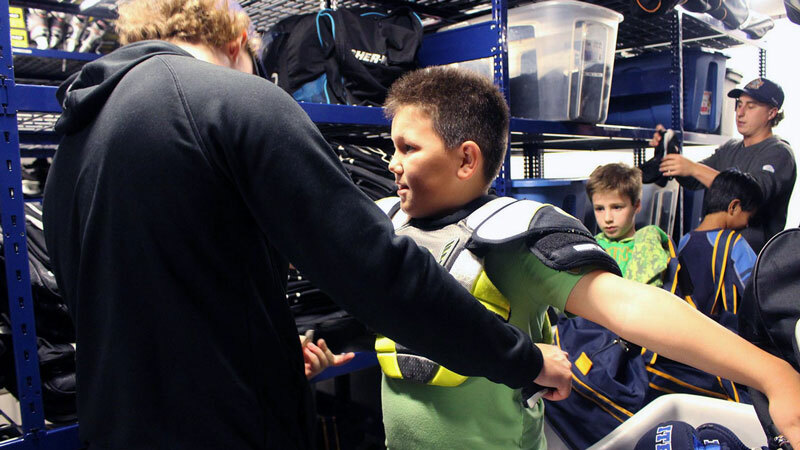 Over the past month, students from more than 20 schools received full sets of hockey equipment, sticks, and ID tags at their equipment fittings. With everyone fitted and equipped, WJHA classes hit the ice the week of October 23rd, while the students participating in the Hockey Canada Skills Academy (HCSA) began their training in September. The traditional WJHA school based program has 510 students each participating in 25 on-ice sessions throughout the school year. These sessions take place during the school day and are designed to help elementary and middle school students have the opportunity to learn how to play hockey while also fostering positive relationships with their teachers, coaches, and teammates. Also through the WJHA, another 250 students take part in the HCSA at the middle and high school level. Participation in the HCSA gives students class credit and helps to fulfill their graduation requirements. Participating HCSA schools have a very strong partnership with the WJHA that includes registration costs and equipment for the student athletes. Additionally, the WJHA provides on-ice instructors to assist the HCSA teacher and continues to provide the after school program to all WJHA students in the HCSA.